How much has Zion Williamson made for himself at Duke? The cosmic confluence of stage and circumstance could not have been more powerful. In the most iconic gymnasium in college basketball one month ago, the central figure in the sport's defining rivalry tore through a shoe made by the world's most valuable sports brand. The response to the freak injury by former President Barack Obama, who was sitting courtside, instantly went viral. Nationwide, an ESPN audience reacted in disbelief, then quickly escalated into overreaction mode. The ripple effect from Zion Williamson's ripped Nike reverberated on both a cultural and corporate level. Nike, which has done more to commoditize basketball players than any other entity, rushed its execs to China to create a sturdier shoe for the 6-foot-7, 285-pound phenom. Meanwhile, the American punditry shouted opinions about what the 18-year-old should do (or not do) next. The central conflict of elite-level college sports — a teenage athlete already worth millions but unable to access it — was left as exposed as the Duke superstar's left foot. With the National Basketball Association's one-and-done rule expected to end as soon as the 2022 draft, Williamson could be college basketball's last transcendent superstar. Zion didn't just tear open a shoe that night at Cameron Indoor Stadium. He tore through the already tattered veil separating amateur basketball and the professional product. The sudden fragility of a Bunyan-esque character who had exploded upon the sport led to one simple question: Why is he toiling for room, board and books? The answers: Because he has to, but also because he wants to. When Williamson sprained his knee a month ago, a significant segment of the populace urged him to never play another minute at Duke — to shut down the season, protecting himself and his status as the likely No. 1 pick in the draft. 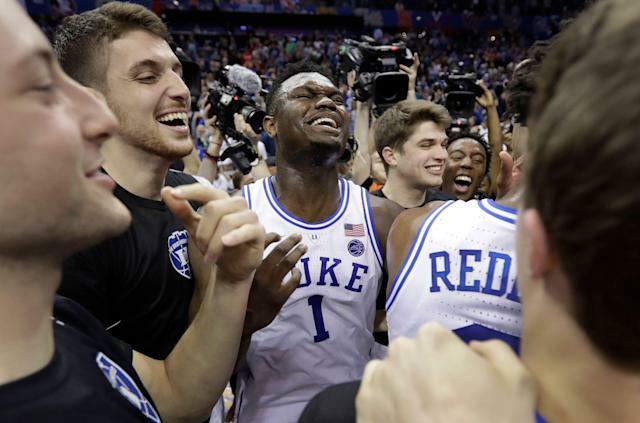 He wanted no part of that, returning after six games to lead Duke to the Atlantic Coast Conference tournament championship last week and the No. 1 overall seed in the NCAA tournament, where the Blue Devils open play Friday. "Why would I pass up in this experience to play in the biggest rivalry ever?" Williamson said after Duke beat North Carolina in the ACC tourney semifinals. "You [can't create] moments like that nowhere else. I mean, just goes without saying. If they still had the high school rule, I'd have still come to college." You can rail against the NBA's age minimum, which prevents players from entering the league straight out of high school. You can decry an NCAA system that restrains Williamson from making a ton of money from jersey sales and endorsements. You can howl about the riches granted to Duke coach Mike Krzyzewski by Nike, while the company's shoes are being worn (and torn) by his unpaid players. But you don't hear any of those sentiments from Williamson's mouth. "I'm not that type of person," he said. "I want to be out there with [his teammates], and I made a commitment to them, and I would be a bad person if I went back on my commitment." In reality, the Zionization of Duke and the Duke-ification of Zion has been mutually beneficial. He is the poster child for the modern era — savvy with social media, the subject of countless viral videos and also allegedly for sale by a guardian asking for "money in his pocket," according to information discussed in federal court last fall. And yet giving it the old college try has only helped basketball's Next Big Thing become even bigger. 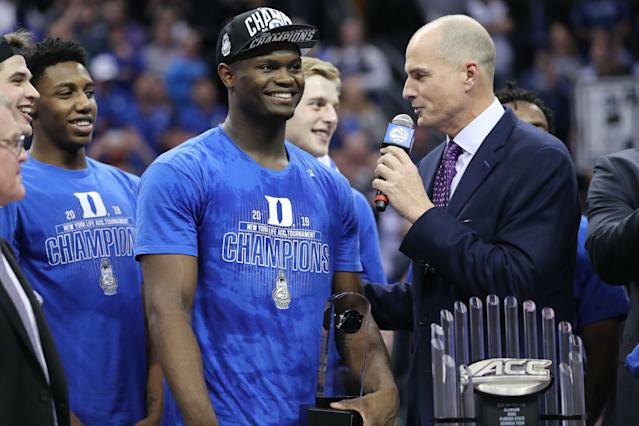 After an AAU tournament nearly four years ago in Lexington, Kentucky, Zion Williamson went to a Shell station with Devontae Shuler, his South Carolina Hornets AAU teammate. After they loaded up on Gatorade, Brisk iced teas and Pop-Tarts, Shuler had a message for the clerk at the gas station: "Remember these faces." At the time, Zion was a 6-foot-3 point guard who projected as a promising high-major prospect, but certainly not the megastar he's grown into. Shuler laughed in a recent phone interview when recalling Williamson direct messaging him via social media earlier this year to poke fun at the great gas-station declaration. Back in those days, recruiters routinely lined up at the Hornets games for Shuler, not Zion or a third member of that team, Murray State star and potential top-five pick Ja Morant. "We were talking about going to college and trying to put South Carolina on the map," Williamson said. "We'd just talk about hoping it happened. To see all three of us come this far, you've got to thank God." Nobody has come farther than Williamson, and with breathtaking speed. In less than four years he's gone from not being the first option on his AAU team to having 2.7 million Instagram followers. To put that into context among recent college sports stars, last year's No. 1 pick, DeAndre Ayton, has 371,000. The last three Heisman Trophy winners — quarterbacks Lamar Jackson, Baker Mayfield and Kyler Murray, two of whom are now NFL starters — combine to have 2.8 million. "It all happened so quick," said Shuler, now a starting guard at Mississippi. "I knew it was coming. I knew it was a matter of time. Him having his own shoe. [With] him not having much when he was a kid. He's going to be living his best life." If anyone has the right to claim prime seating on the Zion bandwagon, it's Rivals.com recruiting analyst Corey Evans. While working for Hoop Scene, Evans recalls being intrigued enough by Williamson to approach his stepfather, Lee Anderson, at the 2016 Bob Gibbons Tournament of Champions in Suwanee, Georgia. Evans told Anderson that Zion was the best player his age in the country. "No one has even offered him a scholarship yet," Anderson responded, then asked Evans to share his appraisal with Zion to boost his confidence. "He was in disbelief when I told him how good he could be," Evans recalled. "He was so innocent." At the time, Zion was about 6-foot-4 and 175 pounds — nothing like the physical colossus he is today. "He had an old-school James Harden body," Evans said. "He was more finesse. He was playing angles so well and he was shifty, but he didn't have the bulk." About six months later, Anderson reached Evans and asked him to change the height and weight on Williamson in his database — Anderson said he was now 6-7, 230. Evans' thought: "Oh, geez, another crazy dad inflating his son's height and weight." But Anderson sent along some grainy video to back it up — "Zapruder film," Evans called it. He saw, and believed. "He's just this monster dunking on people," he recalled. "I was like, 'What the hell happened?' To put on that weight and have coordination and that explosiveness? It was game over." Williamson hasn't stopped dunking on people since. And his career arc has boomeranged — from being hyped up by a teammate at a gas station to where a mere trip to one has become a chore. "I'll go in [to the gas station] and at least be in there 10 minutes because someone wants to have a conversation," Williamson said. "I can't even go to the bathroom sometimes without people bothering me." A bombshell reinforcement of Zion Williamson's future value came on a wiretap conversation recorded by the FBI, which was relayed in federal court in the Southern District of New York in October. In a conversation between Adidas consultant Merl Code and Kansas assistant Kurtis Townsend, the family appears to allegedly ask for benefits that would go well beyond what's allowed by the NCAA. Code said that "the player's father" was "asking for opportunities from an occupational [perspective]. He's asking for money in the pocket. And he's asking for housing for him and the family." Townsend responded by saying, "I've got to just try to work and figure out a way. Because if that's what it takes to get him for 10 months, we're going to have to do it some way." While that conversation could loom large during the NCAA's investigation of Kansas, it hasn't appeared to impact Williamson's season at Duke. He has missed no playing time, and any communication with the NCAA related to what came out in court has not been publicized. The school's October statement from athletic director Kevin White, who declined this week to comment to Yahoo Sports through a spokesman, did not address the specifics of what was read aloud in federal court. It instead fell back on general protocol. It reads in part: "Duke works closely with the NCAA and the Atlantic Coast Conference on all compliance and eligibility matters. As we have stated in the past, we have an uncompromising commitment to compliance in athletics." While that wiretap conversation offers hints at the value of Williamson for his lone college season, few could have envisioned his financial ceiling. Williamson's lone season in college has ratcheted up his earning power exponentially in salary, but especially for endorsements. Zion's mother, Sharonda Sampson, and stepfather, Lee Anderson, have been spotted at multiple Duke games this season with a former NBA agent named James "Chubby" Wells. Anderson and Wells overlapped at Clemson for two seasons in the late 1970s, and Wells began to appear at games during Zion's high school career. When Anderson negotiated his own grassroots team deal for Zion's AAU team, Adidas-sponsored SC Supreme, Wells was involved. The deal was believed to be worth in the neighborhood of six figures from Adidas – essentially a way for a shoe company to endear itself to a prospect's family within NCAA rules. It led to Zion leaving Georgia-based Game Elite to play in a program run by Anderson that showcased Zion. Throughout the past few years, Anderson has called Vaccaro for his guidance on looming decisions involving the AAU circuit and sneaker business. Vaccaro stresses that he's never met Anderson, other than Anderson telling him that they'd met years ago at ABCD Camp in New Jersey. In more than 40 years in the shoe business, Vaccaro has never seen anything like it. "It's almost a Cinderella story," he said. "With the right people around him, he could become a billionaire." As Williamson's fame and game have grown, so has his earning potential. If he stays healthy and produces at an All-Star level in the NBA, the Zion economics could put him in the same stratosphere as Michael Jordan and LeBron James. His shoe contract will be immense — with the stakes ratcheted up by the wardrobe malfunction last month against North Carolina. Vaccaro estimates that it could be worth $100 million, surpassing the $90 million Nike initially gave to James, if realistic competition to Nike emerges. Zion's endorsement potential is through the roof as well, as a likable star with a flair for the spectacular. And his social media reach already is vast — two dunk reels he posted on Instagram as a high schooler have been viewed 3.3 million and 3.5 million times, respectively. The symbiotic relationship with brand-name Duke has helped both entities. Williamson's Instagram following has more than doubled in the last year, while the Blue Devils’ basketball account on Instagram has seen its following multiply geometrically since he arrived. Then there are the TV ratings. Duke had five of the top six highest-rated games on ESPN during the regular season. The Blue Devils-Tar Heels ACC tourney game is the highest-rated championship week broadcast in ESPN history. The game in which Zion's shoe exploded is the most-viewed weeknight game in ESPN history. His draw at the box office is unmistakable as well. With Williamson as its leading man, Duke is pushing ticket prices to Golden State Warriors levels, according to Chris Leyden of SeatGeek.com. Leyden said last year the Warriors increased ticket prices 185 percent on the road, and this year the Blue Devils are driving up the market 178 percent. That's 40 percent higher than the next most marketable college basketball team, North Carolina. That has carried over to the NCAA tournament. The Columbia subregional is the most expensive ticket of the eight first- and second-round NCAA sites, with an average ticket price of $196. And fans anticipating Duke advancing to the East regional in Washington D.C. have already driven up the price there to $274 a ticket, according to SeatGeek, $100 more than the second-most expensive region, the Midwest, which could have brand names North Carolina, Kentucky and Kansas. It's a small wonder that the most powerful and connected agencies in basketball are jockeying behind the scenes to land him when he turns pro in a few weeks. Klutch Sports, headed by James' agent, Rich Paul, and Jay-Z's Roc Nation inserted themselves in the conversation by all showing up at Duke games at various points this season. Chubby Wells is not a registered NBA agent, but his name is buzzing through the league as the liaison to Zion. Both Wells and Williamson's family did not return requests for comment. Vaccaro said he's fielding calls from NBA executives fascinated by how the agent situation will unfold. "There's no frontrunner, where you can bet this guy is getting them or that guy is getting them," Vaccaro said. "It's fascinating." Since making the cover of Slam Magazine at age 16 and seeing famed trend-jumper Drake wearing his high school jersey, Zion Williamson has been a big deal. But going to college has made him even bigger, catapulting him into a rare teenage celebrity status. He is coming to terms with his new normal, which will never be conventionally normal. "I looked myself in the mirror and said, 'This is the life I wanted to be a part of,'" he said. "My parents told me all this would happen. It's not much of a shock, but when it happens you're like, you have to step back and be like, 'Wow, I guess I'm in it.'" Which top seeds were given the toughest roads on Selection Sunday?